Royal Mail announce Paralympic discount to customers who subscribed to Olympic Gold Sheets & FDCs. Some of Royal Mail's customers have kindly sent us a copy of the special offer on Paralympic stamps that has been made to subscribers to the Olympic Gold Medal collection. Although this offer cannot be extended to people who bought piecemeal at Post Office branches, I hope it will be seen as evidence that Royal Mail are not exploiting collectors as so many people have written, and recognise the cost of this summer's stamps to collectors. But the exploitation still exists! Firstly, there is nothing forthcoming from RM as to any solution of the Compendium and now, it is 50% off for the first 29 PGB GMW; if Paralympic GB wins 60 Gold Medals, then it is 31 at the full price? It is for those who have ordered the FULL set of Team GB items and then only up to that number? Not exploiting Collectors? Think again RM!! Why oh why didn’t you wait until the Games had finished before doing anything? First Day of Issue(s) could have been 27 July and 29 August! "You will become eligible for the full discounts on complete collections of ParalympicsGB Miniature Sheets and First Day Covers outlined above." And if you think that having the first day of issue on 29 August for a medal won on the 8th September (etc) makes sense, then you really are up there with the cuckoos. Ok I got it wrong and I apologise, but only to the readers of the Norphil Blog that is, not to RM! I just wonder what they are going to fill their pension pots with next year? To help them along though, may I suggest a Minisheet or Smiler sheet for each of the actors who have appeared as Doctor Who in a fully illustrated compendium ready for January 2013? Oh and before I comment no more, and talking of 'up there with the cuckoos', as I am actually PRO philately and wanting to encourage the youth of today to take it up, I asked my 13 year old Great Niece yesterday if she has thought about philately as a hobby; she said without hesitation “is there an app for that?” Me cuckoo? And the answer is, yes there are several. You can reader stamp catalogues and magazines on iPhones and iPads. A number of young people were at the PO buying when the Olympic gold stamps were issued. At his 7th birthday yesterday one great-nephew remarked that one of his cards was posted with a Paralympic stamp, rather than an Olympic one (the definitives). I've never talked to him about stamps, so maybe it's just a natural thing for some and not for others. I can only hope when you wrote this piece you weren’t being mischievous as i totally disagree with your last statement? It should be re-written ‘as a valued cash cow! Not valued collector. The royal mail of late has a cheek to state valued collector as for the last few years they seem to rip the backside out of us collectors of new postage stamp collections. I have to say I was extremely disappointed to read the letter in this morning’s post. I will be calling to see if they will honour the same deal as I bought all mine in one go from the post office, and the reason I did that was because I could choose the position of the mini sheet as opposed to never getting an acceptable response when I phone and ask for a simple task of cylinder booklets and even m12l £1 blocks which supposedly don’t exist but you showed the pictures and story. ps. Keep up the great work Ian as i do enjoy reading your blog and upto date info. You'll appreciate The_shandydrinker that the main body of the message, with the black background is what Royal Mail wrote. And I still think that this is an important concession by Royal Mail although they obviously won't please everybody. As for your other points, cylinder booklets are equally a problem for us. I order complete packets to find cylinders (or buy them at high street outlets) as Royal Mail philatelic cannot tell from the outside of the pack what is inside - and as you know they show a marked reluctance to satisfy collector customers by actually providing what they want in terms of cylinder booklets or specific security stamps by year. It is only when we know that they have new printings that we can recognise by the date that the year code will be different. Email me direct for more information on this, as this is not the place to go further into that. I think as the majority of these Gold medal stamps will never be used for their proper purpose (ie paying for delivery of mail) RM are on to a good thing as they are hardly losing any money by offering 50% off for the paralympic stamps. My reporter at Dereham post office this morning reports that counter staff were using Paralympic GM stamps on customer letters. One lady had a letter to the USA to which they added 3 x Medal stamps and a 10p for £1.90. For the Olympics I've used more than a dozen of these and stamps from the 'Welcome' miniature sheets on mail to customers. Yes I guess Post Offices are using them like crazy to dispose of 'old' stock. Whereas collector's who buy them will never postally use them. Is all of this information on a letter sent out to customers, I signed up to the GMW subscription and just got the stamps through yesterday but still haven't heard how I can go abut getting a discount on the paralympics ones. Does that mean i will get 29 x 6 of the Paralympics for 50%???????????????????? 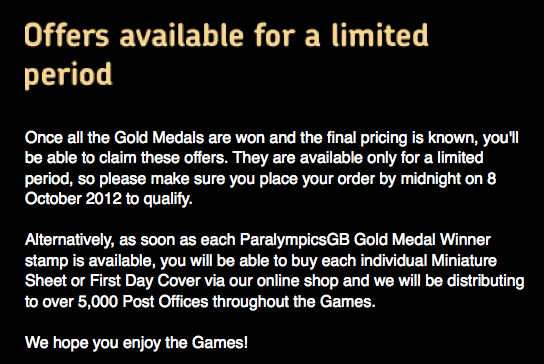 You actually get a discount on the whole Paralympics set (not just 29) - read carefully. 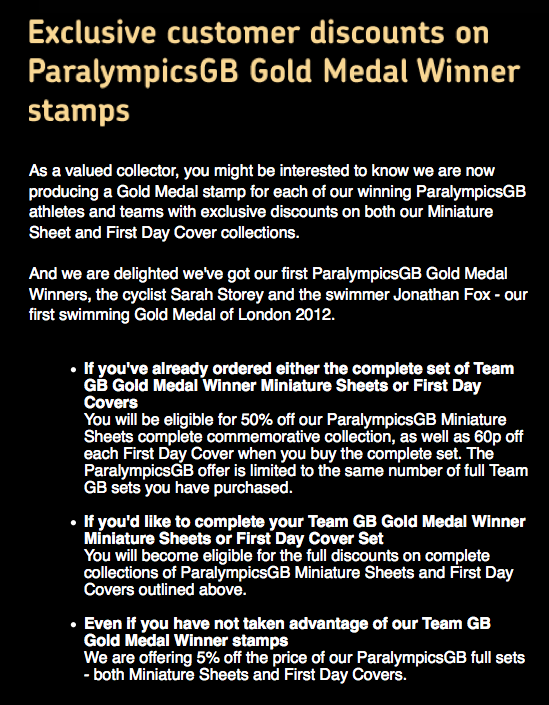 And so you should get 24 sets of Paralympic stamps. But it gets difficult because of the different sheet formats. For Para sheets 1 & 2 you should get 6 sheets as before. For Para sheet 2, you should get 6 sheets x2 because there are only 2 mini-sheets of each design per A4 sheet, so to match the Olympic order you should get double the number of A4 sheets if you want to buy them. The complications increase with sheet 3, which itself contains 4 of minisheet 9, but only 2 each of minisheets 7 & 8. I'm sure you can see where that is going and will be able to work out with Royal Mail what you want, and are prepared to pay for. But it is confusing until you sit down and work it out carefully; I've had the same problem working out our order! Any idea how you get the discount? I bought mine from the Philatic Bureau and I can see all 29 Olympic stamps on my account bought and paid for, but when I order the Paralympic stamps the full price comes up. Tried to ring, but gave up after 15 minutes. Will probably resort to "snail mail" as theor technology appears not to be up to the job. Any word as to how we claim this offer now the Paralympics are over? I've been told by the Bureau that there is no discount for buying a set of full printers sheets.